We are currently having an ice storm. 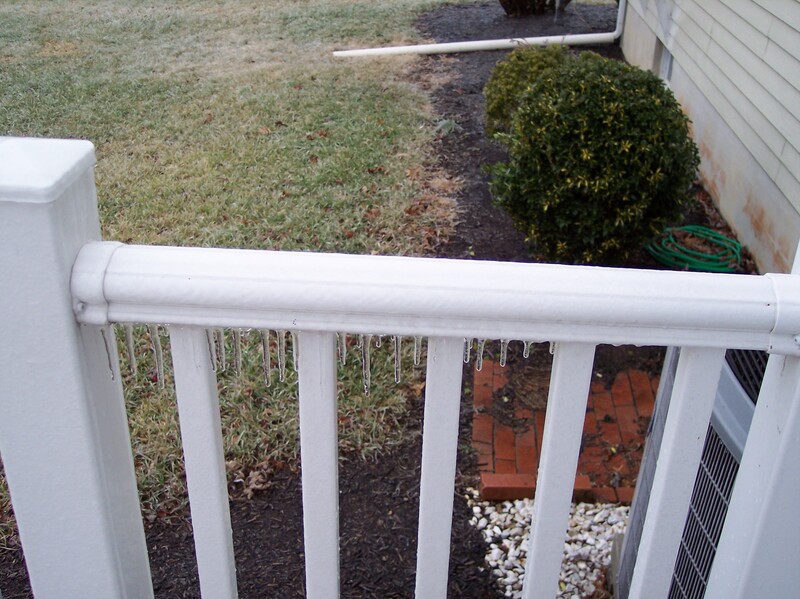 There are icicles hanging from the railing on my deck. The tree branches are all coated with ice making the landscape look like a frosty fairy land. Beautiful, but dangerous. At least the street looks to be just wet now, but I can guarantee you my driveway is treacherous. Weather like this is great knitting weather. It is also great weather for wearing all those cozy wool socks, sweaters, shawls, hats, and mittens. Recently I have been on a sweater jag. I have recently completed three sweaters, Cozy Shawl Collar Aran, James’s Traditional Gansey, and a “White” Gansey, while Gjende needs just a little work and Kinsale is progressing nicely. On January 15th, I will be starting another Aran, Janet Szabo’s Foothill Road Aran, as part of a knit-along. Some knitters specialize and knit only a few different types of items. Some simply enjoy knitting nothing but socks, for example. Others stick to scarves because they are afraid to try anything else. There are some knitters who knit only items for which they have explicit and detailed row-by-row instructions and the exact yarn called for in the pattern. There are others who change every pattern they make, or make it up as they go along. I like to do all kinds of knitting, from simple plain-Jane top-down stocking stitch one-piece raglan pullovers to Dale of Norway ski sweaters, (well, okay, sweater, and it isn’t quite finished yet☺) lace socks to lacy Shetland-type shawls, sweaters with cables and textures, knitted top down, bottom up, with or without gussets, square sleeves, peasant sleeves, set-in sleeves, whatever. I like to try new techniques, learn new ways to do even the basics, such as casting on and off. I like variety in my knitting. I think that is the main reason I always have a lot of different projects started. Some of them are WIP (Works In Progress); I work on them regularly or sporadically, but I am working on them. Others become UFOs (UnFinished Objects) and languish for months, even years, untouched. For some reason, last night the knitting gods inspired me to pull out one of my UFOs, the “We Call Them Pirates” mittens. I have one of the mittens completed and the second one started, but the completed mitten is just a smidgen too small. My gauge is off—7 stitches per inch instead of 6—and I need to frog the thing and start over using a larger needle. I bet you think I am going to say that I ripped out the mitten last night and started over with a larger needle, right? If so, you’d be wrong. No, the too-small mitten is still intact. And still too small, although I keep holding out hope that the next time I try it on, it will fit like a, well, like a mitten. LOL What I did last night was cast on the matching “We Call Them Pirates” hat. I plan to try adding ear flaps, but that will depend upon how the hat fits. I’ll let you know how that turns out. Don’t hold your breath waiting for me to finish. The hat could become a UFO at any moment. Someday the mitten will be frogged and reknit, and it’s mate, too. I need to practice my two-handed stranding. My tension leaves a lot to be desired.